One of the advantages of the MFT system is the ability to mix lenses and bodies from Panasonic and Olympus. That said, DPReview forum member Anders W. has identified what appears to be a general problem with purple fringes when using Panasonic MFT lenses on Olympus MFT bodies. Discussion of the problem is spread over numerous posts in several threads in the DPReview Micro Four Thirds Talk forum. This page is my attempt to summarize the problem, its origin, and its solution in one place. If you are interested in using the Panasonic 20/1.7 lens, you might also be interested in my summary of the banding problem when it is used in combination with certain bodies. When a Panasonic MFT lens is used on an Olympus MFT body, sometimes one sees purple fringing that is not cleanly correctable in software. This problem can be clearly seen in Anders’s 100% crop from an image taken with a Panasonic 20/1.7 lens on an Olympus OM-D E-M5 body. This problem is not seen with Olympus MFT lenses on Olympus MFT bodies or Panasonic MFT lenses on Panasonic MFT bodies. For example, see Anders’s similar 100% crop from an image taken with the same Panasonic 20/1.7 lens on a Panasonic G1 body; this image shows no significant purple fringing. Chromatic aberration is caused by the index of refraction of optical glass changing with wavelength. This in turn causes a lens to bend a ray of light slightly differently at different wavelengths. Compound lenses typically include elements of different types of glass to partially compensate chromatic aberration, but all lenses have residual chromatic aberration at some level. Chromatic aberration is roughly classified as being lateral (transverse), which is a change of focal length or magnification with wavelength, longitudinal (axial), which is a change in focus with wavelength, or both. 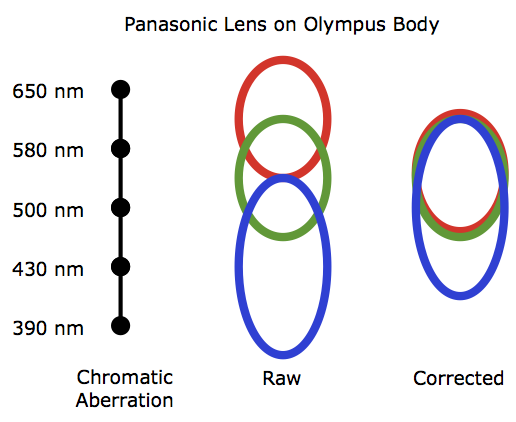 On the other hand, if lateral and longitudinal chromatic aberration are not moderate, the blue, green, and red images seen by the detector are not individually in focus. This can happen either because the longitudinal chromatic aberration is sufficiently severe that the blue or red images are significantly defocused with respect to the green image or because the lateral chromatic aberration is sufficiently severe that chromatic aberration within an individual color image causes significant smearing. Severe chromatic aberration cannot be corrected easily in software. The one-sided nature of the purple fringes seen when using Panasonic lenses on Olympus bodies suggests that they are due to severe lateral chromatic aberration. It is believed that the integrated UV filter in Olympus bodies cuts off at 390 nm whereas the filter in Panasonic bodies cuts off at 430 nm. Presumably, native lenses are designed to give at most moderate lateral and longitudinal chromatic aberration down to the corresponding UV cut off in the corresponding native body. 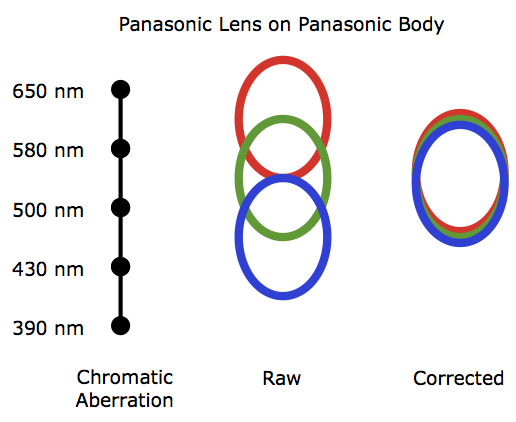 However, chromatic aberration typically becomes more severe towards shorter wavelengths, and it is suspected that Panasonic lenses deliver severe chromatic aberration between 390 and 430 nm. Because of the difference in the integrated UV filter, this aberrated light is not seen by Panasonic bodies, but is seen by Olympus bodies. The two figures below illustrate schematically the origin of the problem. They show a small spot of white light being imaged by a Panasonic lens with simple lateral chromatic aberration. In the first figure the lens is used with a Panasonic body and in the second it is used with an Olympus body. In each figure, the ruler on the left shows how the image shifts with wavelength because of lateral chromatic aberration, the rings in the middle show the edges of the spot in the raw images formed by the red, green, and blue pixels, and the rings on the right show the edges of the images of the spot after correcting in software for lateral chromatic aberration by scaling the raw images. In the first figure, with a Panasonic body, the lateral chromatic aberration stretches the spot as seen by the red pixels (580-650 nm), green pixels (500-580 nm), and blue pixels (430-500 nm) into slightly elongated ellipses. However, the ellipses are all about the same size, so a simple scaling in software can align them and largely correct chromatic aberration. In the second figure, with an Olympus body, the spots seen by the red pixels (580-650 nm) and green pixels (500-580 nm) are similar to those seen with the Panasonic body. However, because the Olympus body is sensitive down to 390 nm and because chromatic aberration increases dramatically into the UV, the spot seen by the blue pixels (now 390-500 nm rather than 430-500 nm) is much more elongated. When we perform the same scaling as before, we are left with residual blue light on one side of the spot: this is the purple fringe. Not all of these lenses suffer equally. For example, the 14-42/4-5.6 PZ is reported to show weaker fringes than the 20/1.7. I would welcome information on other lenses. Anders’s solution is to use a filter to block UV light below 430 nm. Compare Anders’s 100% crop from an image taken with an Olympus OM-D E-M5 body and a Panasonic 20/1.7 lens and a sheet of Wratten 2A gel to the similar 100% crop without the gel; the purple fringes are insignificant in the image with the gel. The following figure shows the transmission curves for Wratten 1A, 2A, 2B, and 2E filters (from Kodak Photographic Filters Handbook, 1990). 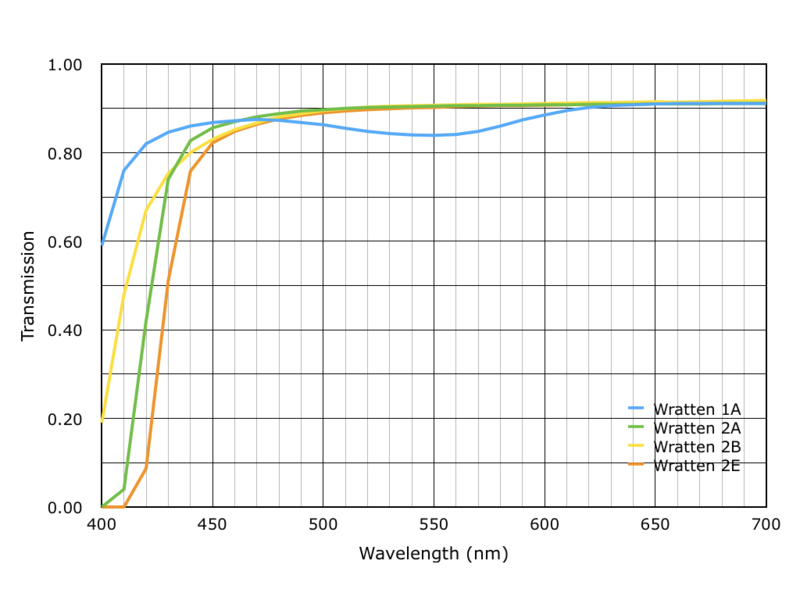 The Wratten 2A filter has a 50% cut off at about 423 nm and the 2E filter has a 50% cut off at about 430 nm, about 7 nm further to the red. Anders has had good results with a 2A gel. The 2E gel is slightly “stronger”, which means that it will transmit less blue light but might reduce the purple fringing even more effectively. Most other common UV and “skylight” filters do not help significantly, as they are too “weak” and have cut offs too far into the ultraviolet. Unsuitable gels and filters include Wratten 1A and 2B UV filters, Hoya 1B filters, Formatt UV MC, UV 370, UV 400, and UV IR Cut filters, and B+W 415 and MRC UV 010M filters. If a filter is not explicitly listed above as being suitable, it is more than likely to be unsuitable. The recommended Wratten gels and Tiffen, Formatt, and B+W filters do not have anti-reflection coatings, which means they reduce the transmission by about a third of a stop (10%) and may be more susceptible to flare, which to some degree can be controlled by a lens hood. Using these filters might require a small correction to the white balance. Anders says that in his experience, automatic white balance takes care of the small temperature adjustment but the tint may need to be tweaked manually in order to avoid a slight greenish cast. With the exceptions of the 8/3.5, 7-14/4, and 12.5/12, Panasonic MFT lenses accept external filters with 37, 46, 52, 58, 62, and 67 mm threads. Of these sizes, the Tiffen filters are available from stock for all but 37 and 46 mm threads and the Formatt filters are available from stock for all but 46 mm threads. Using a 46-to-52 mm step-up ring, a 52 mm filter, and a 52 mm lens cap. Note, however, that both versions of the 20/1.7 have a special “parking manoeuvre” in which the inner barrel retracts inside of the outer barrel; a step-up ring would interfere with this. Using a 46-to-43 mm step-down ring, a Formatt 43 mm filter, and a 43 mm lens cap. For all of these lenses, a 43 mm filter should be perfectly adequate and not give vignetting. You might get very slight vignetting with the 14-42/3.5-5.6 II manual zoom, 15/1.7, or 35-100/4-5.6 if you stack a second filter (e.g., a polarizer or a ND filter). See below for more details. If you prefer not to use an external filter, you might try adapting Ander’s internal solutions for his 7-14/4: either taping a gel to the rear baffle or adapting the gel holder from the 8/3.5. The 8/3.5 lens does not accept external filters, but instead has an internal rear holder for gel filters and can use Wratten 2A or 2E gel. Taping a piece of gel to the rear baffle by means of thin double-sided adhesive tape (if the tape is too thick, the gel may protrude too much into the body). This was Anders’s original solution. Adapting the lens to use the rear gel holder from the 8/3.5, following Anders’s instructions. The gel holder costs about $30 in the USA and about €10 in Europe from Panasonic service centers such as Geissler Service. Adapting the lens to take large external filters. The special-purpose 3D 12.5/12 lens has no provision for a filter. However, if needed, it might be possible to fix a gel to the rear with tape. As an alternative to mounting a filter on the lens, DPReview forum member Ken Strain reports successfully installing a gel filter in the body, immediately in front of the sensor. This disadvantage to this is the potential for damage to the sensor. This information on availability is believed to be correct as of summer 2015. In the USA and Canada, 2A and 2E gels are easily available (e.g., from B&H). The cost is about $40 for a 75 mm square. In Europe, 2E gel is available from Knight Optical. The cost is about £40 for a 75 mm square. There are no known suppliers of 2A gel. In other parts of the world, it seems to be very difficult to find either gel. Your best hope might be to find an old bricks-and-mortar shop. In the USA and Canada, 2A and 2E filters are available from B&H and 2A filters are available from Adorama. The cost is typically $20. In Europe, try Amazon. I’ve found 2A filters in 49, 52, 58, 72, and 82 mm at Amazon.co.uk and 49, 52, 55, 62, 72, 77, and 82 mm at Amazon.de and Amazon.fr. In the USA and Canada, 2A filters are available from B&H. The cost is typically $50. In Europe, 2A and 2E filters can be ordered directly from Formatt (info@formatt-hitech.com). I’ve not been able to find online dealers for B+W 420 filters. I would welcome additional information on availability. I have no information on whether this problem is seen on Olympus bodies with other native lenses, such as those by Samyang, Sigma, and Voigtländer. Many older adapted lenses give significant purple fringes. It is reasonable to expect that these might be more severe on an Olympus body than on a Panasonic body, for the reasons explained above. The Panasonic 7-14/4 lens shows not only with purple fringes but also purple flare when used on Olympus bodies. The purple-flare problem resembles the purple-fringing problem in that both become visible on Olympus bodies due to the relatively weak integrated UV filter. However, they differ in that the purple flare is not caused by chromatic aberration but by the antireflective coatings on one or more lens elements not working well for wavelengths between 390 and 430 nm. Using a strong UV filter like the Wratten 2A or 2E on this lens cures both problems. DPReview forum member Christof has posted a comparison of the effect of 1A, 2B, and 2E filters on purple flare. He finds that 2E is better than 2B and 2B is better than 1A. This is in line with the cutoffs of the filters: 1A below 400 nm, 2B at 410 nm, and 2E at 430 nm. The partial reduction reported by Christoff with a 1A filter is apparently in conflict with Anders’s experience that a Hoya 1A filter does not reduce the flare significantly and the observation that a nominal 1A filter has a cutoff below 400 nm. It may be that a Lee 1A filter is stronger than a nominal or Hoya 1A filter. I suggested above using a 46-to-43 mm step-down ring and a 43 mm filter on lenses that take 46 mm filters. Might this cause vignetting? In this formula, the 21.6 is the diagonal of the imaging area of an MFT sensor in mm. This formula can be used to estimate whether a filter of a given diameter might cause vignetting. For example, the diameter of the objective in the 20/1.7 is about 19 mm, and so the diameter of the beam on the front surface of a filter at 10 mm is (19 + 10 × 21.6/20) mm = 32 mm. Provided the distance from the objective to the front surface of the filter can be kept within these limits, vignetting should not be a problem. The basic understanding of these problems and their solution was largely developed by Anders W. Other DPReview forum members also contributed information on other lenses. I thank forum members Anders W., Christof, and Paul De Bra for suggestions which have improved this summary. 05 July 2017: Noted that the 12/1.4 is also reported to suffer from fringing. 25 April 2017: Noted that the Hoya 1B filter will not help. Added a report of fringing with the Panasonic 42.5/1.7. Noted that purple fringes from older lenses might be worse on Olympus bodies. 13 July 2016: Added a link to the post by Christof on the effect of 1A, 2B, and 2E filters on purple flare. 14 August 2015: Added a comment from Paul De Bra that the 14-42/4-5.6 PZ suffers less than the 20/1.7. Expanded the list of unsuitable filters to mention Formatt filters. 19 July 2015: Added information from Christof on the Lee 1A filter. 14 July 2015: Original version.